What looks lovely and tastes even better? No answers for guessing that it is this salad made from sweet corn twisted with a tangy taste. The salad provides a riot of colours thanks to the capsicum which brings a healthy dose of antioxidants like carotenoids, vitamin E, vitamin C on the table. Treat your eyes and your palate to this wonderful salad. We have even given you ideas to jazz up this salad to suit your taste and nutrient needs. Mix the boiled sweet corn with all the other ingredients given above. 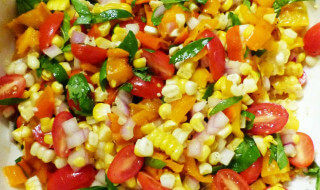 And you are ready with tangy corn salad.